Added on November 6, 2016 by Marisa Seguin. It is currently 20˚C in Milwaukee in early November and the end of July is not feeling as far away as it usually would. I can't believe it's been over three months since I left for Iceland. I had the amazing opportunity to travel with Light Grey Art Lab this past summer as part of their annual Iceland Residency program. Every year, the gallery invites artists to meet and learn from fellow creatives as they explore this beautiful country together. I met up with a group of ten other amazing artists and the three LGAL staff in Reykjavík at the end of July and we spent five days together in Southern Iceland. We hiked into lava tubes, scrambled over moss covered boulders, wandered through fields of flowers as tall as us, and chased many, many waterfalls. Here are a few highlights from the trip! I arrived in Reykjavík at nine in the morning to the brightest blue sky and we had sunshine and clear skies nearly every day of the trip. The weather in Iceland is really unpredictable and we were told to bring layers as it can also vary wildly just driving around from place to place. The group that had traveled with Light Grey the week before us got to see the rainier, mistier side of Iceland we were told. 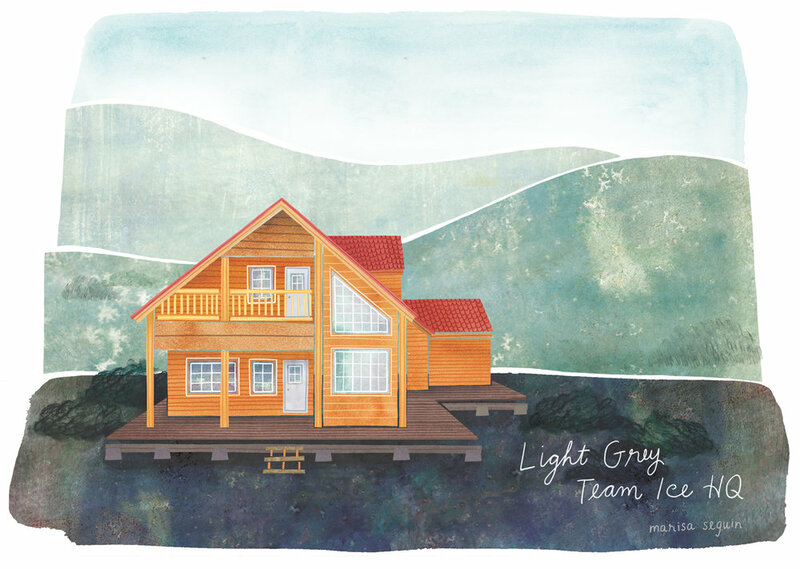 Light Grey Team Ice headquarters was a prefab house on a hill overlooking Þingvallavatn Lake. It was our cozy home for five days of workshops, breakfasts, dinners, and many late night board games. This was literally just the side of the road between the house and Selfoss. We pulled the van over just to lie on the moss. We snacked on wild bilberries (bláber) nearly everywhere we went. Small, dark, round berries similar to a blueberry but smaller and more tart. Swimming in the pool at Seljavellir pool was one of my personal favourites from the trip. It is the oldest swimming pool in Iceland and we spent an amazing afternoon on our last day together floating in the mossy, geothermally warmed waters while we marvelled at the vast mountains shrouded in fog that surrounded us. In the evenings during all of the amazing workshops, I often found myself completely enthralled in whatever we were learning about and would then glance up to see this and remember, "Oh yeah, we're also in Iceland!" I had the best time traveling around with this incredible group and can't wait until I can return to this beautiful country to explore more. You can use credit cards pretty much everywhere for any amount. People won't bat an eye if you pay for a coffee with a credit card. A light waterproof windbreaker that folds into a pocket/pouch will be your best friend. The blog I Heart Reykjavik had a lot of great information that I used while prepping for my trip. Two memorable meals that I had in Reykjavík: the best fish and chips I've ever eaten at Icelandic Fish & Chips (this is a big statement for me to make because I didn't think that I would ever find better than Go Fish in Vancouver) and a beautiful last evening spent at Snaps. I stayed at two different places in Reykjavík during my trip. Ordinarily, I would book an Airbnb but I left my planning a bit late this time to book a good one in my prince range. My first night I stayed at Kex Hostel. Despite reading that it was not very centrally located I quickly learned that Reykjavík is very small and walkable and "not centrally located" equalled a short ten minute walk to the city center. The staff was very friendly, I didn't eat there but have heard really good things about the food, and it was a quick walk to the beautiful sea walk along the harbour where I snapped the top picture. My only complaint is that the bunk beds were extremely squeaky and I felt like I was disturbing the entire room every time that I turned. (On the plus side, it was a good bonding topic of conversation with my roommates the next morning as we all apologized to one another for our squeaky bunks). As far as hostel nightmares go, this is a very minor nuisance. The second place that I stayed was Igdlo Guesthouse. This one I actually would consider "not very centrally located" but it was still only a twenty minute walk to the city center. My room was nothing fancy, but did the trick for a night's stay. The staff was very friendly and it was a very short walk to the BSI bus station which was very useful when I needed to wake up early the next morning to take the Flybus to the airport.